⚓ T71212 Suggestion: Add camera stabilization to the UAV, and maybe other aircraft eventually. Suggestion: Add camera stabilization to the UAV, and maybe other aircraft eventually. Right now, it's quite hard to lase a target or track it because of the UAV movement, especially when it's circling around somewhere. I suggest adding a button that lets you lock your view on a stationary/mobile target. another thing: Drones should remain stabilized on a target if you release controls from the turret, so that if you switch to a guided launcher(MLRS, helicopter, etc..) or if you just decide to manually fly the drone, it will remain locked and keep its laser shining if it was previously enabled. nmdanny set Category to UAV (Unmanned Aerial Vehicle). nmdanny set Reproducibility to N/A. nmdanny set Severity to None. nmdanny set Resolution to Fixed. nmdanny edited a custom field. Definately, the lack of satabilizing camera is the only gripe I have with UAV's right now really. Camera gets a bit jittery when at the highest zoom which makes it even more difficult to try and track a target manually. If they add that to this vastly updated game feature then it will be perfect in terms of overall capability and control. Yes, the ability to lock the camera to a ground position or simply having greater stabilisation would be great. Right now the MQ-4 jitters rather a lot as it lines up to engage a lased target from the turret; which throws the turret's POA off right before that critical moment where the aircraft launches a missile. This can increase the chances of of missing the target quite substantially if the aircraft doesn't stabilise long enough to correct the turret POA before it launches a missile (without much warning due to the fact missiles are released without a "command fire" order). Yes there needs to be a way to lock the camera on a target and to keep it stabilized. Also like Da12thmonkey said the uav should not have to tilt nose down to fire a laser guided missile. Also there should be a command fire when a user is in control with the turret/ sight. Numpad / gives you some stabilization just FYI but I know you're not after that. /And now that I really tested those that doesn't help much when the UAV is waving like crazy. Especially the winged UAV needs this, not the small ones so much. Dslyecxi's camera stabilisation is the exact effect that you can find on real optronic ball. I think BI's UAV's (ArmA2) always suffered the "camera-axis-lock" effect. This is probably because the movement of the camera should need 2 animated sections 1 for controlling X,Y axis and the second (the actual camera) only Z axis. btw The "Geo lock" and "gradual zoom" is among features you should fight for at ANY cost. I think he wants ground locking. At least that Mando video is also showing that. There's some kind of locking that I said earlier but it doesn't work always as you would want. What stonestriker is saying is that the camera should remain in a position even when it's not locked on something, so you don't have to fight the UAV movement to look around = stabilization. The Dslyecxi tube link above is really interesting. It'd be great if the UAV turret camera functioned in a similar manner. As others have pointed out, its difficult to keep the camera still and focused when the UAV flailing around, updating its position. Camera stabilization would be great! One of the main things that isn't implemented that needs to be is the ability to have the ball track grid points, not just targets. The current lack of point tracking makes it impossible to see a target let alone effectively laze a target for CAS. 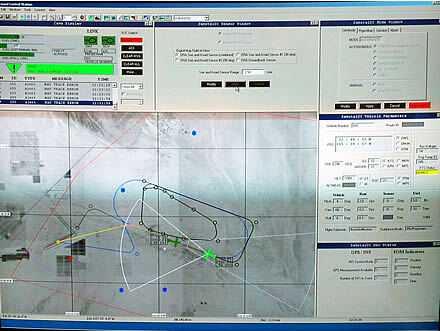 Another essential feature needed is the ability to type in a grid into the UAV control screen and have the camera slew to and track the grid mark. SA would be much improved over what it is now. Thumbs up for these suggestions. I think they had gyro stabilizing of vehicle cams already back in the 80's. Just imagine trying to point a laser at something a few kilometers away by hand. Nope. Really not that easy to keep it stable. As of the latest dev patches, some minor stabilization has been added, however the optics don't stick too good and tend to move, especially when moving at higher speeds, or when using the Greyhawk UAV. More specifically, when loitering around an area in the greyhawk, and I stabilise on a house, the optics don't stick to the house but rather follow a circle which goes through your stabilised position every revolution. Also because it takes some time for it to begin the stabilization, you need to position your optic slightly left/right of the target, depending on the drone's direction. I suggest that instead of the stabilization automatically happening after about 1-2 seconds, you could press a button to stabilise instead. Plus, the new-stabilisation doesn't work with moving vehicles obviously, this should probably get addressed. this is why i suggested to remove the automatic waypoint followed by AI when it takes control of pilot role. When the player switch from the pilot role to gunner role, the uav should not move from itself at all. the uav should keep the same direction, altitude and speed, like an autopilot. this would completely remove all parasitic movements when shooting laser guided weapons. that's really annoying indeed, I was going crazy in the Win episode, in the mission with the drone, trying to find a way to get this turret align on my target... I gave up :( Hope it gets fix soon. the drone should circle around the laser point of interest. that's one easy and not too degraded, solution. Mass closing tickets marked as resolved more than 1 month ago. If the issue is in fact not resolved, please create a new ticket referencing this one and ask for it to be re-opened.